This is a new condominium project that will feature 12-16 story towers. The project is located at 489-533 King Street West in the Toronto neighborhood between Spadina Avenue and King Street West. The condo project is still in its pre-construction stage. It will be composed of a total of 514 condo units for mixed use. The concept of the project was aimed at avoiding footprints of the already existing podiums and towers in the city. In fact, according to the founding partner of Bjarke Ingels Group, it makes no sense to have a city with homogenous structures and this is why the architect came up with an innovative design for this project. The pixelated-look that extrudes upwards and falls downwards makes it entirely distinct. It will create spaces for residential houses, retail as well as boutique offices. The unparalleled design makes it an iconic structure and the focus on green space renders it a standalone project of its own kind. 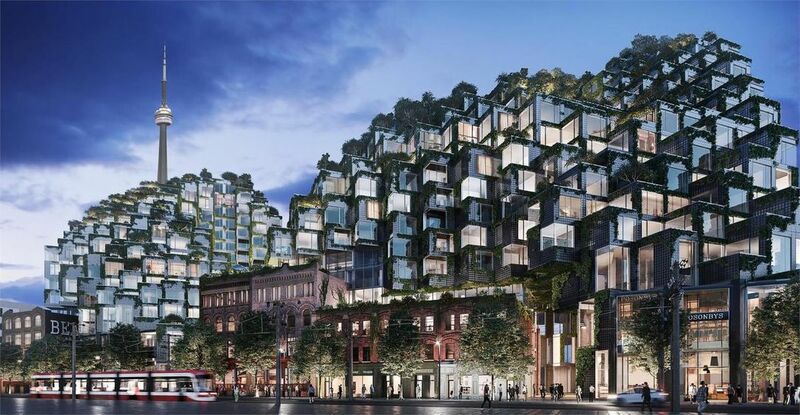 The development will also create a distinct center for the Toronto community by connecting various pedestrian paths that cross the area. With a public plaza at the center, the building looks like a traditional perimeter block.